The present Bendigo Town Hall was begun on this site in Hargraves Street in 1859 as a simple two storey brick Italianate structure, designed by the town clerk and surveyor, George Avery Fletcher. After various additions and alterations over a number of years, the Town Hall developed into an elaborate municipal structure. This building was pre-dated by the first town hall building, a two roomed timber building located on View Point and purchased for this purpose in 1856, after the first council elections. The town hall in Hargraves Street began as a brick building with sandstone dressings and corrugated iron roof, facing the open market square to the north with projecting bays on either side enclosing a ground floor arcade with a balcony above. Matching porticoes were attached to the east and west sides. This building provided the basis for the design of all future extensions and the structure for the southern end of the building. In 1866-7 an extension was made to the north of the existing building, in front of the central recess; therefore forming a light well in the town hall building. Designed by Fletcher, this addition contained a council chamber on the upper floor with two rooms beneath, and a colonnade and balcony surrounding it to the east, north and west. Fletcher designed a further addition to the north in 1871-2, and this contained a corn exchange in the form of a large hall, with basement below. Located on Hargraves Street, this corn exchange defined the northern part of the present main hall. The north elevation, with two projecting bays and central colonnade, resembled that of the original building. This addition, and the previous one, both maintained the same general style as the first town hall building of 1859. A major remodelling of the Town Hall was undertaken between 1878 and 1886, to a master plan by Bendigo architect William C. Vahland, and this resulted in a dramatic change in the character of the town hall building. Many existing entries, porticoes, internal walls and windows were reused, with alterations to the exterior including the addition of three towers and mansard roof, and to the interior including the rearrangement of ground floor offices, extension of the upper floor, and extension and remodelling of the main hall. In 1885 the exterior of the building was rendered and plastering of the interior was commenced, modelled by Otto Waschatz. The painting of the main hall was finished in 1902, finally completing Vahland's master plan. The final main phase of remodelling was undertaken from 1913-15 by architects J. Beebe with J. G. Austen and E. J. Keogh. It entailed work mainly to the interior of the south end of the building. 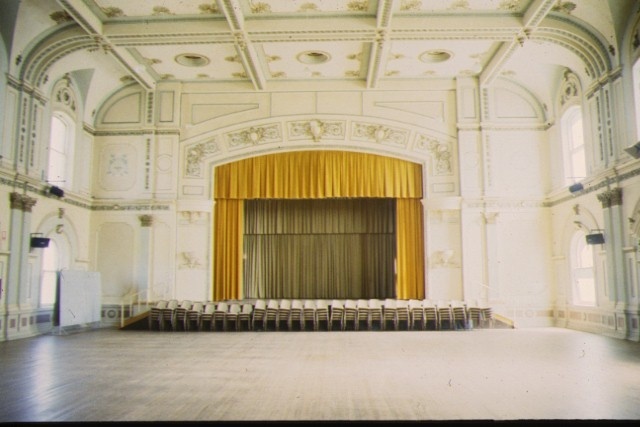 In 1926 the main Hargraves Street hall entry, foyer and balcony was replaced by a stage and other minor alterations were undertaken through the 1970s. The Town Hall stands as a complex and sophisticated boom style building in a mannerist style, largely as completed in 1886. The facades of this freestanding building are asymmetrical and deeply modelled, incorporating rustication, deep broken pediments, alternating triangular and segmental pediments, layers of varying orders with the Corinthian predominant, paired pilasters and columns, and skyline interest in the form of three towers, mansard roofs and balustrading. Vahland?s retention of portico and side entry locations, and his continuation of semicircular openings at ground level and segmental heads at the upper level, have been cleverly incorporated in his overall design. The first phase of the building in fact provided the elevational layout of external openings for all the later work. Extensive restoration works were begun at the Town Hall in 2000. This included the reinstatement of the Hargraves Street entrance, foyer and balcony, involving the demolition of the 1926 balcony, and the reinstatement of original decorative schemes and conservation of the extensive artwork. 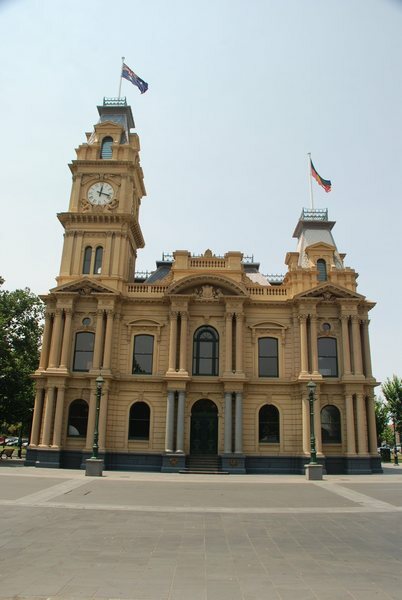 The Bendigo Town Hall is of architectural, aesthetic and historical significance to the State of Victoria. The Bendigo Town Hall is of architectural significance as a particularly notable example of mannerist architecture which evokes the pretensions of Bendigo in its boom period. It is of architectural significance as an important work of the prominent 19th century Bendigo architect, W. C. Vahland which displays his skilful adaption of an existing building, while at the same time maintaining much of the existing fabric and layout. The three dimensional quality of the design is unusual with equal attention given to more than one facade. The Town Hall is of architectural and aesthetic significance for the fine interiors of the main hall and council chamber, which include elaborate plasterwork and hand painted panels. The association with important artist and modeller, Otto Waschatz, who was also responsible for plasterwork decoration at the library at the Bendigo School of Mines, and the Melbourne Town Hall is of particular note. The Town Hall is of architectural significance as a major work in civic design of the late 19th century and for the prominent role it plays in the townscape of Bendigo. 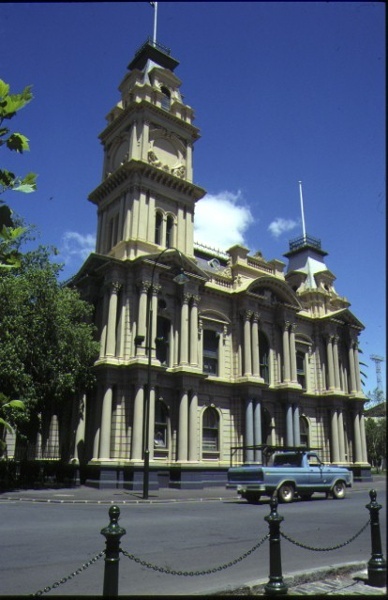 The Bendigo Town Hall is of historical significance due to its association with the development of Bendigo, a major centre for gold mining in the nineteenth century. The elaborately decorated building demonstrates the prosperity of Bendigo, particularly in the 1870s and 1880s, and it is illustrative of the civic growth that occurred as a result of the mining industry. City of Bendigo. No. 117.Bendigo TownHall,Hargreaves Street, Bendigo. A major remodelling of the Town Hall was undertaken between 1878 and 1886, to a master plan by Bendigo architect William C. Vahland, and this resulted in a dramatic change in the character of the town hall building. Many existing entries, porticoes, internal walls and windows were reused, with alterations to the exterior including the addition of three towers and mansard roof, and to the interior including the rearrangement of ground floor offices, extension of the upper floor, and extension and remodelling of the main hall. In 1885 the exterior of the building was rendered and plastering of the interior was commenced, modelled by Otto Waschatz. The painting of the main hall was finished in 1902, finally completing Vahland’s master plan.